Mio first appears halfway into the anime series. She is a character exclusive to the anime version of D.N. 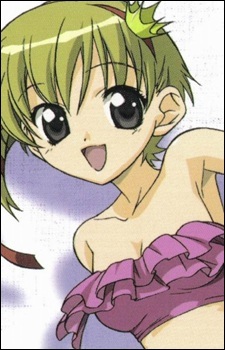 Angel, a student who suddenly transferred to Daisuke's school (as shown in episode 14). All that is known at that time is that she left for America and stayed there for 2 years before coming back to Japan. First impressions of Mio is that she is a rather simple minded "valley girl" (or an American gaijin in the Japanese version, even going as far as to say "Sorry! I can't speak Japanese!" when confronted with certain demands or, in the English dub, telling Riku in Spanish that she can't speak English. It is later revealed that she is actually a voodoo doll living in a temporary body and promised a real life by Satoshi Hiwatari's adoptive father, Kei; however, in order for her to attain a real life, someone must be sacrificed... in this case Daisuke. The initial reason why she occupied herself with Daisuke was to get him to wear a powerful magical charm (actually a pair of charms [one in the shape of a heart, the other in the form of a heart shaped key] and the pair must be interlocked when worn for the magic to activate) that would then seal his soul within it; however, over time she eventually fell in love with him. She wanted a real life, but not at the cost of Daisuke's. Mio then decides that she refuses to give up Daisuke's life and ventured to retrieve the magical charms from Riku (whom she had given to in hopes that she would get Daisuke to wear it). Despite her actions, she arrived too late at the Harada house seeing Daisuke and Riku out in the backyard, both with the magical charms around their necks. Unable to stop them, she used her powers to negate the charm's effect and sealed herself within Riku's charm before Hiwatari's father was able to negate her temporary life.